Does text therapy actually work? In a cab on the way to JFK airport, I was glued to my iPhone, per usual. Only this time, I wasn't texting my friends, I was confiding in a therapist I had never met. Talkspace, one of several digital therapy providers, offers unlimited text therapy for $25 a week. The all-you-can-text therapy startup, founded by Roni and Oren Frank about a year ago, gives people easy, cheap access to licensed therapists. And nearly 100 therapists are providing "textual healing" to some 70,000 people through the platform. 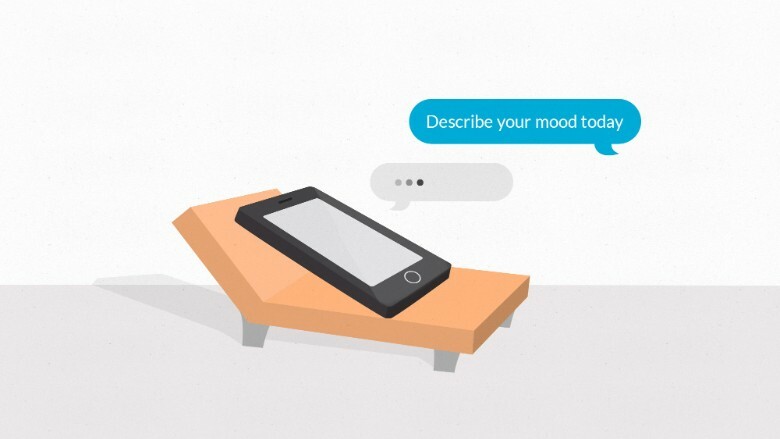 "Can text message therapy actually work?" I wondered (as did my editors). So, I tested out Talkspace for a week. I was set up with Nicole Amesbury, a licensed professional health counselor based in St. Augustine, Fla., who also happens to be the face of Talkspace. I was at a work conference for the beginning of the week, so I wasn't sure when I'd be able to open up the app and text. Luckily, this didn't matter. "The asynchronous chat is meant to fit into your life easily," wrote Nicole. "You can come here anytime you want, 24/7 and post your thoughts. Some people like to look at it as an interactive journal with a therapist." Related: Can this app cure loneliness? I spent about fifteen minutes a day texting Nicole (I disclosed upfront my full name and that I was a journalist, though users have the option to stay anonymous). I texted with her about everything from my work anxieties to frustrations with the guys I'm dating. Sometimes she'd reply within minutes, while sometimes it took several hours. Initially, Nicole told me she'd reply once a day, up to six days a week, but she actually texted me much more. Off the bat, I recognized many of the traditional counseling tactics: encouragement to distance myself from the problem ("Imagine yourself as a friend. Would you say to your friend, 'You know Sara, I think someone else can do better than you?'") and validation of my thoughts ("What I hear is that you are telling yourself that you know less, therefore you deserve less."). I was surprised by how much she was able to read between the lines, as she encouraged me to expand on certain issues or return to something I'd mentioned before. Despite not having much background on me, simple questions in response to my dating distresses ("[Why aren't you] allowing yourself any more options?") caused me to reflect on my own relationship history, and why I was viewing my current situations through a black-and-white lens. 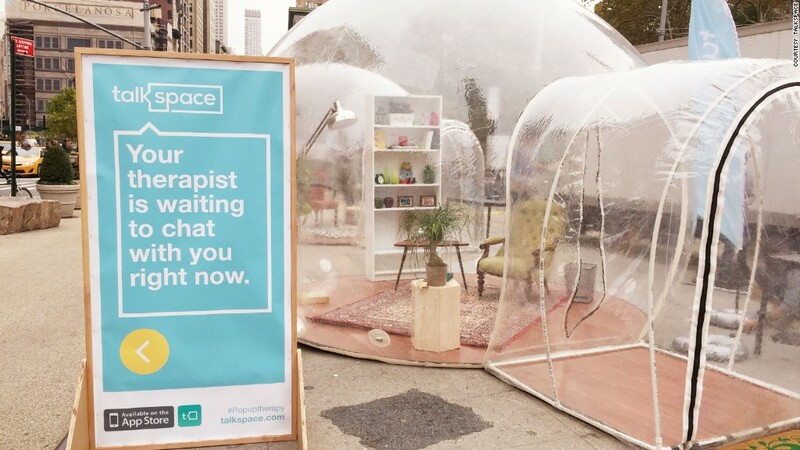 To further erase the stigma of therapy, TalkSpace has a pop-up therapy installation in New York this week. Unlike me, most of Talkspace's users aren't twenty-somethings. Many are mid-40s to 50s, according to Christy Paul, a licensed therapist who now works full-time with Talkspace clients (she texts roughly 30 clients a day). Talkspace users tend to communicate about three times a day in the beginning and then scale back over the course of several months. There's no shortage of those in need: roughly 46 million Americans had a mental illness in 2011 but only 39% sought treatment. Barriers for seeking treatment include the cost, stigma and time commitment. Talkspace aims to erase those barriers. "It's like WhatsApp with a therapist," said founder Roni Frank. But according to Columbia University psychological researcher George Nitzburg, online therapy solutions like Talkspace (which raised $2.5 million in funding in May) are only really effective for a subset of patients. Those with serious addictions or risk-taking tendencies (like self-mutilation or reckless driving) need more treatment than digital therapy can provide. "Most online or texting therapy forms don't offer crisis counseling or emergency services," said Nitzburg. "In my view, this is missing the mark." Though I'm undecided about whether I'll resume texting therapy now that my research is done, Nicole did help me step outside my thoughts. In responding to her questions, I not only filled in the blanks for myself, but also shared parts of my past to ultimately get much more awareness about myself and my anxieties than simply texting friends and family would have done.